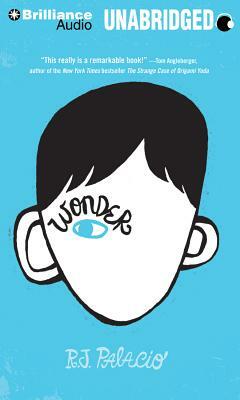 August (Auggie) Pullman was born with a facial deformity that prevented him from going to a mainstream school until now. He's about to enter fifth grade at Beecher Prep, and if you ve ever been the new kid, then you know how hard that can be. The thing is Auggie's just an ordinary kid, with an extraordinary face. But can he convince his new classmates that he's just like them, despite appearances? R. J. Palacio has crafted an uplifting novel full of wonderfully realistic family interactions, lively school scenes, and writing that shines with spare emotional power. "Wonder" is a book with such a big, wide heart it shows how we are all fragile, imperfect, and perfectly beautiful creatures. A wonderful novel by a wonder of a writer Julia Alvarez, author of "Return to Sender," "Before We Were Free," "Finding Miracles," and the Tia Lola Stories.